not so little tummy | For everything that can be eaten, drunk, & digested. For everything that can be eaten, drunk, & digested. Will it be like scones? or moist? Ok… this was a new taste… I really think this was undescribeable. I was actually 50-50 on this, some part of me liking it, the other part…. screaming ‘NOPE…’ The taste that we made was freshly sour and very perfume-y (most probably, because we add too much cilantro). I usually love the sweet and sour taste. Its just a new feeling, tasting that in sweet potato based dish for me. Now the texture is what boggled me up a bit though, the one that we made is very-very dry. As I looked into the picture from the original source, I really hoped that it would be moist in the inside and kinda crunchy on the outside. So I was a bit disappointed when I did my first bite. But I have to admit that this recipe is very easy to make, and might be delicious to someone else’s taste bud. WOW! Wait, wait a second! There’s so many things happen in my mouth once i put it inside! Sweet, sour, a bit dry (maybe we cook it too long) and my nose kind a dancing to this dish. I don’t know whether i like it or not. This is new to me and i don’t really know how to describe it. At time like this, i really want to record our reaction and give the video to you. For your imagination, we make this face while eating it. I hope it explain a lot. Conclusion : I don’t think this recipe was made for us. CORRECTION! I don’t think we should make this recipe FOR NOW, i think we should go to a restaurant that can make this dish properly, then recreate it. Wish us luck, we don’t think we’ve seen palafel in Jakarta. 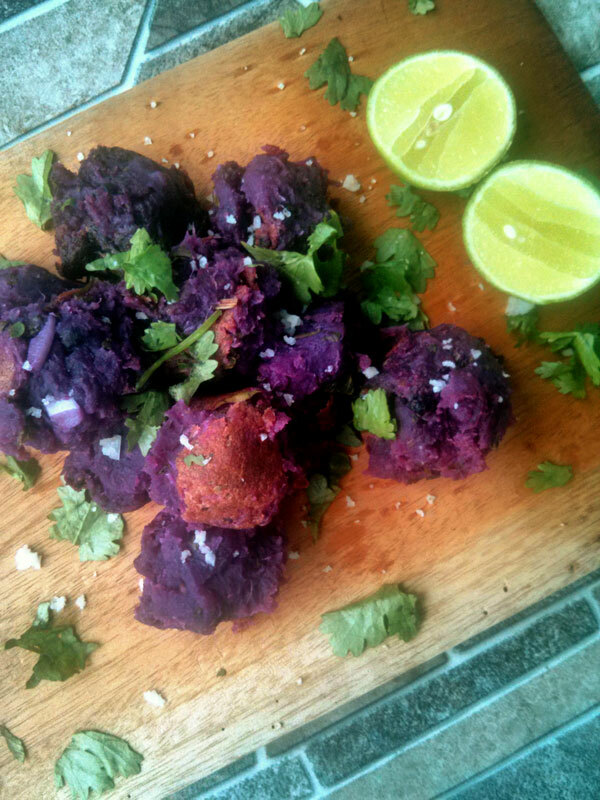 Do you have another falafel recipe? Please give us your link. We really, really curious about this dish. After we failed the last time, we determined to get the recipes right, using the right ingredients (sweet potato, DUH). And we even got directions from the maker of “From Brazil to You” (Thanks Denise!). After we read her explanation, we got quite fired up to try this again. Well, if you read our post before, you will know our thought about this recipe. Why is this always happening? I am officially regretted doing the first one with potato, because this one is simply superb! LOVE IT. The ‘awkward’ taste from previous trying was definitely coming from the potatoes. For me, this is a light dish with sweet taste and a hint of savory from the coconut milk. And when we add a bit salt, it taste perfect. And it’s easy to make too. Definitely going to be one of my comfort food. Yummy! P.S. With or without bacon this dish is still delicious. I’m glad I give this recipe a second chance. I’m glad Denise give us advice. Because even though without bacon, this mashed sweet potato taste good! I don’t really know how to describe it, but it taste “complete” not awkward like our previous (NOT) sweet mashed potato. The coconut milk compliment sweet potato, cilantro give a kick to it, i bet if we put bacon into it, this gonna be perfect. This is one of the dish that actually could get you loving it without doing too much. Definitely a win! Tahu gejrot, basically is an tofu fritters dish with Indonesian spicy tamarind sauce, as corny as it’s sound, we have no idea on how to translate this dish’s name to english. And after trying to make Indonesian food last time, we simply want to share another simple dish! Fried your tofu to golden brown, then chop it to bite size, so you have beautiful white and golden brown color. Let the mortar and pestle out! Grind that salt, shallot and garlic. To make the sauce; Boil some water, put palm sugar, tamarind paste. If your sauce already boiled, turn down the heat, and let it cool down. After it a while you can mixed it with the spice that you grinded before. Prepare your bite size tofu on a plate and pour the sauce! Easy right? It is healthy and low calorie as well! You might have a difficulty to gather all of the ingredients, but it will be worth it! Especially if you love spicy food! Just to let you know, there’s no such thing as right or wrong about the spiciness level, our 10 bird eye pepper might cause violent stomachache to somebody else, so please work with the level of your spiciness. The tofu that you use have to be a fluffy one. This is because the tofu need to absorb the sauce and firm tofu have a lot of water content that will block the sauce from absorption. If you don’t have any sweet soy sauce a.k.a kecap manis, you can use honey as substitute, but it will taste five times better if you use sweet soy sauce. Also you can find DIY sweet soy sauce recipe online, but we never try it yourself, so we don’t really know which one we have to recommend to you. As usual you can use food processor to blend your shallot and garlic, but better keep the texture, we never found tahu gejrot with smooth texture sauce before. This dish come from Cirebon, a port city in West Java, 231 km away from our city Jakarta. But you can find this food anywhere in Jakarta, especially near by college and school, because it’s a cheap and easy snack! 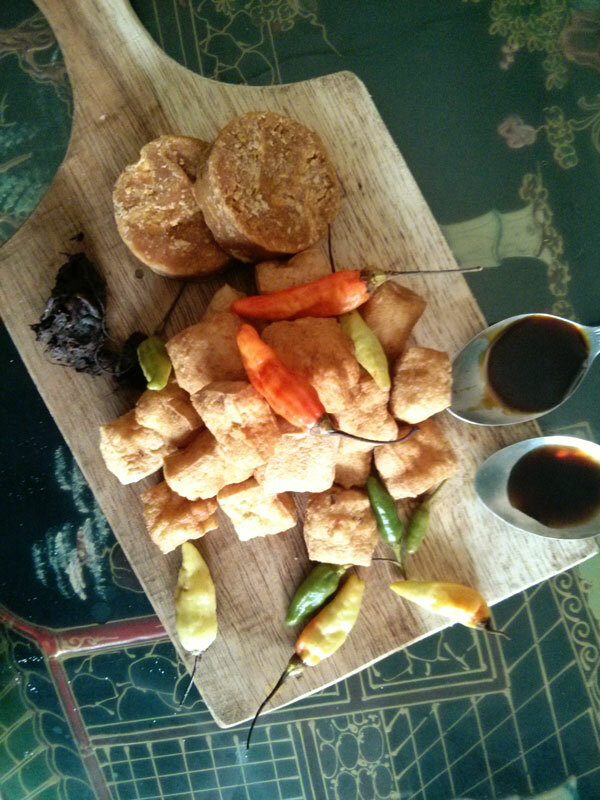 It’s a healthy snack, but remember to eat it moderately, we find the taste of tahu gejrot’s sauce so addictive, we always eating too much of it! We already preparing for our next recipe, it will be not spicy as our other recipe! Enjoy this recipe, and remember if you have any question, we are just one comment away! 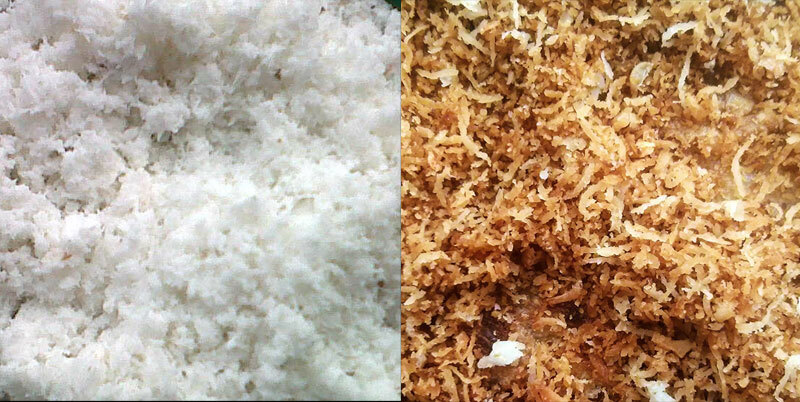 Before and after toasting the desiccated coconut. See that golden brown beautiful color!! Some recipe require toasted desiccated coconut or maybe toasted sesame seed, for an example this recipe: kerak telor. And being Indonesian, we used a lot of both ingredients. So, here is a simple step to toast something,in Indonesian style of course. For example, we gonna toast desiccated coconut. Clean your frying pan or wok, make sure you don’t have any kind of dirt, oil or any kind of liquid on it. Stir it constantly and quickly to even out the heat (don’t ever stop, seriously, if you stopped some part will be browner than others. It got easily scorched in short amount time), keep stirring until the desiccated coconut turn to beautiful golden brown and you can smell hint of delicious nutty aroma. 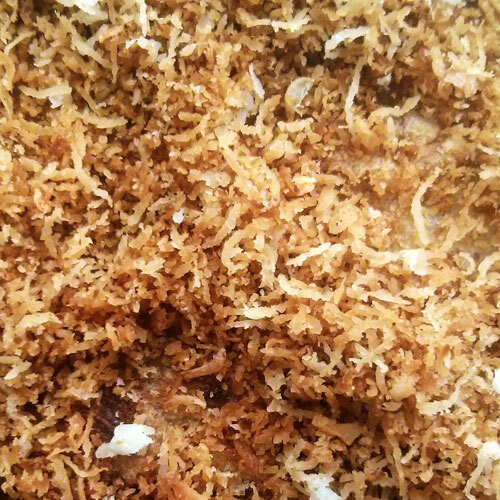 Turn down the heat, and enjoy your toasted desiccated coconut. Basically it will be the same whether you want to toast desiccated coconut or sesame seed, you have to bring that golden look and their best aroma. We hope this simple steps help you! Trivia: Toasted in Indonesia means Sangrai and also Panggang (roasted), and that’s why sometimes we mistook toasted with roasted. Another case of miss in translation, LOL! 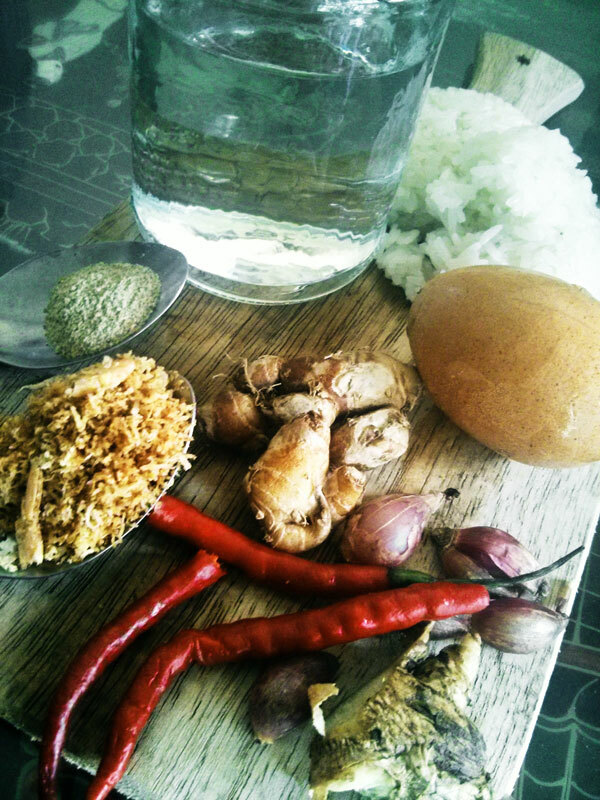 The basic ingredients of kerak telor. pinch of white pepper powder. 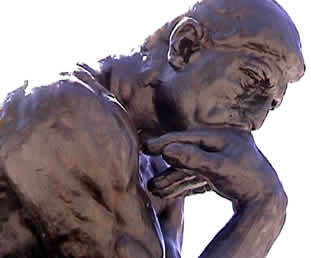 Work with your pestel and mortar! Grind that galanga, ginger, fresh cayenne pepper, finish it with white pepper powder! You can also use food processor, but personally we love the texture of pepper flake. Prep your wok, put some oil on it! saute all the grinded spice to enhance the aroma. Place your glutinous rice on a bowl, crack some eggs to it, sugar and the sauteed grinded spice (it sounds ridiculous, but technically right, right?). Please remember to put the sauteed grinded spice little by little to your liking (we tend to go all out with our spice, it might be way too much for anybody else). And blend it! Every 1 minute or so, open the lid, and press it again using spatula to maintain the shape, If it’s already got harden, flip! Cook till both side become golden brown! Already golden brown? Turn down the heat! Now put generous amount of toasted dessicated coconut and ebi on top. At this point you actually can eat it! but we always fold it to half, put another batch of toasted dessicated coconut, dried ebi and fried shallot on top. Our recipe is already shorten and simplified, the authentic recipe will require you to soak uncooked glutinous rice overnight (8 hours minimum) and to literally, flip the wok with the batter inside to burn the batter till it cooked (abang kerak telor-asian acrobat cooking style! Whattaaa!). We don’t want you to burn your wok nor yourself, so to be safe, just flip that batter like us (read: newbie). Easy peasy. Let the abang kerak telor do the pro stuff. desiccated coconut and ebi texture. When we say “Now put generous amount of toasted desiccated coconut and ebi on top”, we meant it! Nothing will go wrong with it, since the main flavor of kerak telor should be savory from the coconut and spice with sweet hint from sugar. Beside using chicken egg, you can also use duck egg. The different between chicken egg and duck egg is duck egg have a special taste that will enhance the flavor of your kerak telor. We heard glutinous rice is gluten free and safe for celiac disease! Kerak telor as we write before is one of the most well-known Jakarta food originated from the native betawi people. When we were a little girl, we can buy it everyday, but now this delicacy become quite rare, a lot of Jakarta’s traditional food diminishing, you can only find them in some spot, or in Jakarta’s birthday month. Jakarta birth date is 22 June (FYI. Sarah’s birthday is 20 June, Sarah add that one), we celebrate Jakarta birthday with Pekan Raya Jakarta or some people might call it Jakarta Fair, a month long exhibition where you could watch music concert, hoard on discounted goods, this year we also have beauty pageant contest, and of course, eat some kerak telor. We hope you like this recipe, if you cook it, please tell us your opinion! And if you have a question about our recipe you can also ask us, we are just one comment away! Sauteed spinach and Mushrooms, when we first look at the recipe, with the grand total of 6 ingredients that was easy to get in Indonesia and easy intructions, we already got hooked. When we first make this blog, we commit to ourselves, we gonna learn to cook, we gonna learn to cook something new, even it’s something we never had before. Sarah and Dina, two best friends live in Indonesia, pretty much omnivore, don't have any kind of allergy, and tolerant to almost everything (read: glutton). We love to try new recipe and new restaurant of course. You can contact us, on our email: mynotsolittletummy@gmail.com We eat, we drink, we digest!